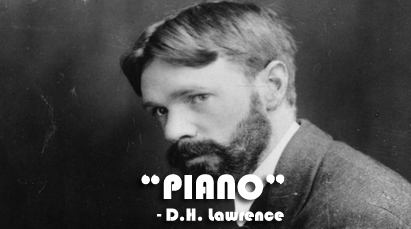 Four Levels for PIANO, written by David Herbert Lawrence, who was born on 11 September 1885AD. He died on 2 March 1930AD. He was an English novelist, poet, playwright, essayist, literary critic and painter. His collected works represent an extended reflection upon the dehumanizing effects of modernity and industrialization. In them, he confronts issues relating to emotional health and vitality, spontaneity, and instinct. Lawrence's opinions earned him many enemies and he endured official persecution, censorship, and misrepresentation of his creative work throughout the second half of his life. 1. Literal Comprehension: The poem is written by David Herbert Lawrence. He is famous poet. This poem is a nostalgic one. It makes the poet remember his past. A woman's song reminded the poet of his childhood when he was sitting under the piano. His mother was playing and singing. He innocently pressed her feet, but she sang on smiling at him. The poet tried to control himself, but the woman's clever song took him back to his boyhood when he was singing hymns with his family members sitting in the warm room. Later the poet did not like the woman's song because he was deeply lost in his childhood memories and he began to weep like a child. He forgets his present. He pretends to be a very small child on his mother's lap. 2. Interpretation: This poem is composed by describing an event that took place in an evening. The poet is trying to say that the function of music is to release us from the consciousness and sensory world. It gives pleasure. It makes us forget sadness, worry and tension and gives fun. But, here when the poet listens to the piano he just remembers his past and starts to weep like a child. Generally, a person likes a song that can touch his/her heart or feelings. That music is favorite which reminds any person free from the trouble of the present. But sometimes the song makes one serious. 3. Critical Thinking: Human being is naturally kind and peace loving creature. It is natural for a person to weep like a child in the presence of a person that likes most. This poem is an honest record of controlled emotion of the poet. This is a strong feeling of a poet who has lost his mother; she used to play a piano like the woman. It is very nice poem but some questions can be made. It is real that a man weeps while listening to a piano ? Does a poem make a mature man so serious ? 4. Assimilation: This poem made me remember my past. As Lawrence I also used to live with my mother and she used to tell me stories. Before reading this poem, I used to think that I was the person who would be very kind while listening to music and song. But now I know that the poet as well as other persons have the same attitude towards their past. The remembrance of a well spent life is sweet. That brings to a very happy past days. So when I like to remember my happy past and my mother I listen to serious songs and have a nostalgic feelings. 0 Response to "Piano | Four Levels"